With any project, you need a place to start! With the enGAGE line of standard kiosks you can build off of an existing foundation to create something that not only meets your needs, but will exceed your vision. This go-to-market design strategy holds true when designing kiosks as the enGAGE platform is designed to meet manufacturing norms and in-field standards so that when the kiosk gets to the field it is well suited for the environment in which it is deployed. The enGAGE line was designed to meet the foundational requirements of many vertical markets within the kiosk ecosystem, as kiosks provide a wide variety of services from helping shoppers navigate a mall to directing business people in a building to checking in at a hotel. Finally, because the enGAGE platform has already laid the groundwork of a standard kiosk it serves as an industrial design that gives you more than a concept to start with, but it shortens time to market and lowers the engineering costs involved with conceptual design phases normally associated with a from scratch kiosk design. 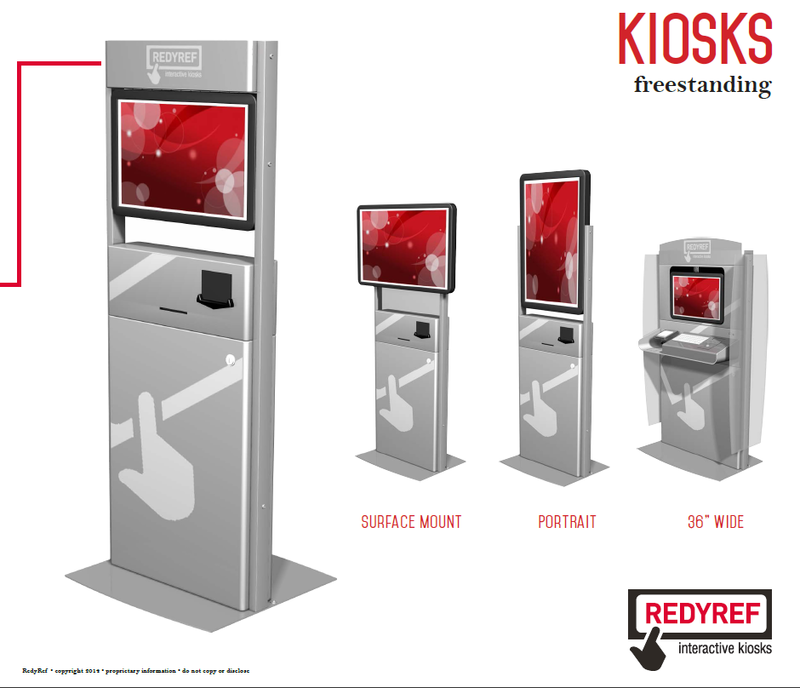 We all know, kiosks serve many different purposes and starting from a base and working up to build something that is unique and can fit your needs is exactly what RedyRef does every day! RedyRef engineers work with clients to build around a standard kiosk that turns into a functional and unique kiosk for their business. This means the design, capabilities and functions are all suited to your specific needs. If you want turnkey operation, than RedyRef is the kiosk manufacturer for your business because you can choose a design and adapt it to your vision. Choosing a manufacturer that can integrate an array of component options to your kiosk is key because you want something that can perform exactly how you want it. Take for instance the option of fitting your kiosk with screen sizes that vary from 15 inches to 60 inches with touchscreen functions and even outdoor readability application. Perhaps you want to integrate advanced safety features like biometric securities that cover fingerprints, iris and facial scanners. The options are truly limitless because the engineers at RedyRef can give you recommendations based on your needs and explain to you all the component functions available. Will your kiosk need a printer port…keyboard…card reader…currency acceptance? If so, RedyRef can integrate one or all of these features into your kiosk to fit your needs. Things like speakers, document scanners, phone handsets, vinyl decals, pin pads, proximity sensors and much more can all be added for your convenience! 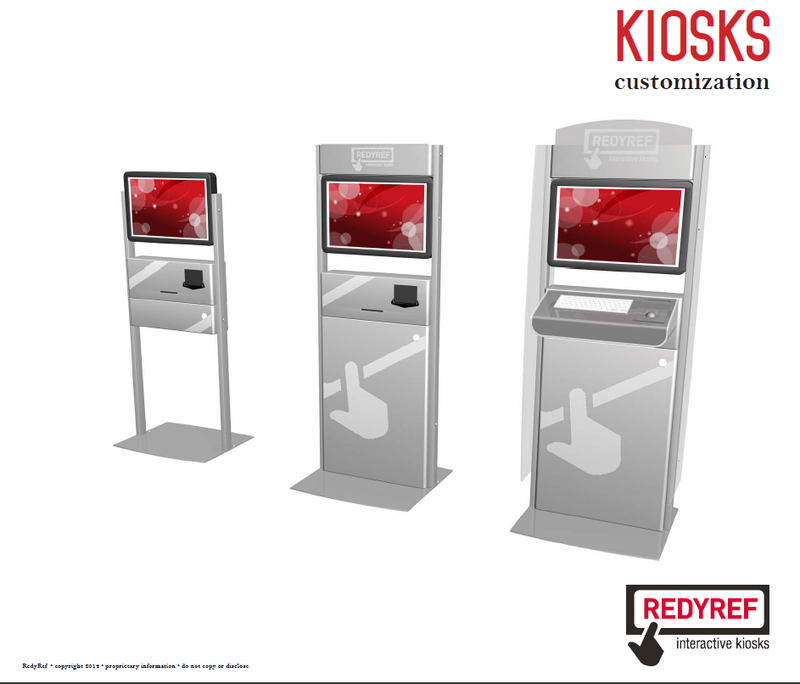 If you need a turnkey kiosk solution, rely on RedyRef to be your kiosk manufacturer!